It does not seem possible that it has been a third of a century since I worked with Enn Pajur, the then-principal of Sharbot Lake High School, to install the first computer in an Eastern Ontario school in September of 1978. Being involved in the evolution since then has been fascinating. Those 4K Commodore PETs with their chiclet keyboards and audio tape recorders are a far cry from the 16-gigabyte tablets used by so many kids today. Surprisingly, both were priced about the same, and the impact on education of both is huge. With BASIC built-in, high school students had their first hands-on experience with computers and some dabbled with programming. With the exception of a few simple math tutorials and some word games, there really was not any educational software. Teachers were very creative, but in those early days, it was teaching about computers, not through them. Drag. Drop. Deliver Everywhere. With Impatica for PowerPoint Version 5, a quick drag and drop is all that is needed to convert PowerPoint content into high-quality online presentations that will play everywhere: on computers, iPhones, iPads and other devices. Impatica’s unique player uses HTML5, when available, to view these fully animated and narrated slides, but still works when HTML5 support is not available. That means that subject matter experts can focus on creating great content using the tools they know without having to concern themselves with where and how it will be viewed. “Impatica for PowerPoint Version 5 really does allow users to build once and deliver everywhere” said Michael Doyle, Chairman and CEO of Impatica Inc. “Today, after over two years of dedicated effort by our highly experience team, we are extremely proud to announce this new product. By adding HTML5 support to Impatica for PowerPoint Version 5, our plug-in free delivery has been extended beyond PC and Mac users to include those using iPhone, iPad, Android, PlayBook and other mobile devices. Access is simply through the web browser without downloading any additional software from an App Store or elsewhere,” added Doyle. In addition to reaching many more devices, Impatica for PowerPoint Version 5 extends and enhances its support for SmartArt, artistic effects on shapes, pictures and text (e.g. shadows, 3D effects, reflection, etc. ), charts, graphs and WordArt. Impatica for PowerPoint is currently used by thousands of universities, colleges, schools and corporations around the world to rapidly produce content for direct delivery over the Internet or from a variety of popular Learning Management Systems. 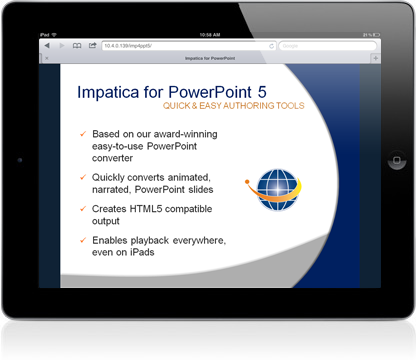 Version 5 of Impatica for PowerPoint maintains its award-winning ease of use. Users simply drop a narrated PowerPoint presentation into the Impatica for PowerPoint program and seconds later a compressed impaticized presentation is ready for deployment through an LMS or web site. Students and corporate users alike are relying more and more on smartphones and tablets, such as the iPhone and iPad, for their access to the Internet. By eliminating the dependency on Flash and Java, Impatica has once again leaped ahead of other PowerPoint conversion tools, to reach users, plug-in free, regardless of platform. Those attending DevLearn can come by booth 308 to see PowerPoint to HTML5 conversions in action and at the same time enter a draw to win an iPad. 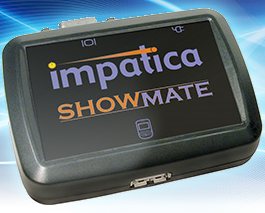 Impatica has been in business since 1998 and produces a number products targeted at the education and mobile device market. In addition to Impatica for PowerPoint, these products include Impatica OnCue, Impatica viaDock and the Impatica ShowMate. Impatica is excited to be exhibiting at DevLearn 2011 in Las Vegas. There, we’ll be launching and demonstrating Impatica for PowerPoint version 5, the easiest way to convert PowerPoint presentations into HTML5 compatible content. Drag. Drop. Deliver Everywhere. With Impatica for PowerPoint version 5, a quick drag and drop is all you need to convert your PowerPoint content into high-quality online presentations that will play everywhere: on computers, iPhones, iPads and other devices. Our unique player uses HTML5 when available, but still works when it is not. That means that you can go about creating great content using the tools you know without having to worry about where and how it will be viewed. Come by booth 308 to see how easy it is to create great HTML5-compatible presentations. The SANS Institute is the largest provider of computer security training in the world. They first evaluated Impatica OnCue over three years ago. When we first met with their management team, we realized that while OnCue Version 3 met many of their needs, we had a ways to go to meet their medium and longer-term objectives. Along the way, the world changed! Apple turned the world upside down with the introduction of the iPad. Google got into the OS business big time with Android and HTML5 became a standard especially with Microsoft’s introduction of IE 9. These all provided new opportunities and challenges for both SANS and Impatica. SANS offers their courses at major conferences about a half dozen times a year. Courses range in length from one to six days. All content is collected (audio, video, demoes, PowerPoint slides and other course materials) at the conference. Hackers are finding new ways to access confidential personal, corporate, government and military information every day. SANS instructors are experts in the field of data security and constantly update their courses. The biggest challenge for SANS OnDemand, the online version of their classroom courses, is to launch new courses quickly and keep them up-to-date. To meet these needs, we took OnCue, our award-winning tool for synchronizing video, PowerPoint slides and associated notes, and made it even better. Version 5 contains a set of tools not only for synchronizing a wider variety of content, but also inline editing of video and audio files. And the output from OnCue 5 is played by our unique new presentation player that uses HTML5 when available, but still works when it is not. As I said, instructors constantly make changes to their course. The challenge for OnDemand editors is to find those changes and update the existing course immediately following a conference. OnCue Version 5 rapidly identifies where the courses have changed, allowing the content developer to immediately focus only on the changes. “Three years ago we thoroughly vetted many different software providers and selected Impatica to build SANS OnDemand. Impatica has truly proven to be a wonderful development partner,” said Eric Bassel , Director at The SANS Institute. “They spent a great deal of time understanding our business and the unique challenges we face. They listened and learned very well and have become an extremely responsive partner that understands our needs and designs solutions accordingly. Impatica OnCue allows us to rapidly create and update courses of extremely high quality”. In November 2010 SANS announced a promotion based on iPad delivery of SANS technical content. “Using OnCue, we were able to create one version of our content for all devices without compromising quality. Impatica enabled us to run the iPad promotion, which was our most successful promotion ever. In order to run this promotion, Impatica literally worked night and day to hit a very aggressive time schedule. I’m convinced few software providers could have successfully achieved this,” he added. The following videos show how SANS OnDemand has deployed Impatica technology. OnDemand Overview from SANS Institute on Vimeo. iPad – SANS Ondemand from SANS Institute on Vimeo. I know many of our clients have been waiting patiently for Version 5 of OnCue and Impatica for PowerPoint. Just send us a few minutes of your content and we will create a compelling presentation that you can load on your server or LMS. We will show you how easy it is to create content Once and Deliver it Everywhere…on your PC or Mac, iPad, Android Tablet, PlayBook or most smartphones. To find out more, feel free to email me directly: mdoyle@impatica.com. It has been an exciting voyage we can’t wait to show you the result! The SANS Institute is the most trusted and by far the largest source for information security training in the world. Three years ago SANS selected Impatica as their software provider for SANS OnDemand. In November 2010 SANS announced a promotion based on iPad delivery of their content. Using OnCue, they we able to create one version of their content for all devices including the iPad without compromising quality. The iPad promotion was their most successful ever! At the SANS 2011 Conference Vendor Expo, Impatica will show the technology behind SANS OnDemand. Visitors will see how techniques and technologies developed by Impatica to meet SANS’ needs can be used to get their content online for delivery to secure environments and even to the iPad. In a nutshell, Impatica viaDock enables you to access your BlackBerry from your personal computer. Impatica viaDock can be operated in either normal view or mini view. The normal view displays the handheld screen, supports input from your PC keyboard and mouse and offers a variety of time-saving tools for operating your BlackBerry. The mini view is a small palette that can be kept in view while using other applications so that you may monitor your BlackBerry status and quickly place and receive phones calls.